Got a dud Tweed Deluxe that's just not cutting it? Have the Speed Shop turn it into great performer. Consider sending your chassis to the Speed Shop for a tune-up to Studio-Series specifications and performance. Rondo can repair and/or modify your 5E3 to Studio-Series specification, so that it will not have too much bass response and will sound great when overdriven and played clean. Average charge is $350 to overhaul a 5E3. Return shipping ($50 to conti US) not included. This charge covers addressing major build issues, correcting errors, full testing of existing components, and replacing [basically] all the caps and a few other parts, bringing it inline with my Studio Series platform. Other parts, if required for repair, would be extra. Hot Rod Service results are generally very, very good; with bad sounding, toneless amps routinely brought up to great sounding, inspiring players. 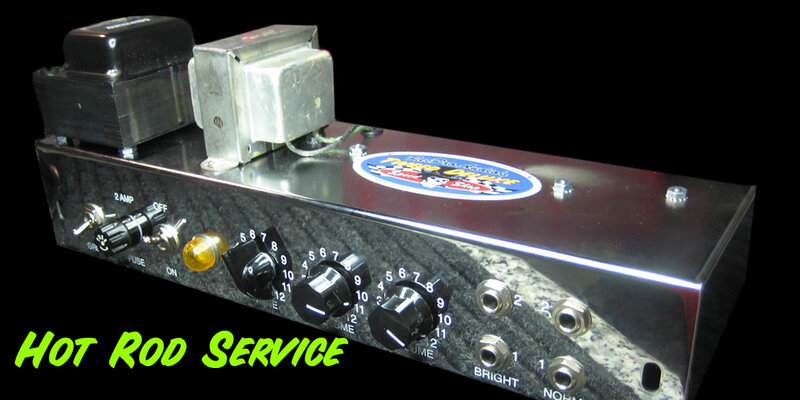 In addition to making your Deluxe a player, Hot Rod Service can increase the value of your amplifier. All that is needed is your chassis (and tubes, if you'd like them tested and auditioned as well). If you are interested in this service, you might send some photos of the amp interior so that the current condition can be evaluated (not all chassis are worth the investment) and Rondo will get back to you. Feel free to call 239-689-5941 or write Rondo to arrange service and/or ask any questions. "The amp is awesome! Whole new beast. The breakup is something it simply didn’t do before. Sure glad I had you do the work. Nice job!" - D. A. "I just wanted to let you know that the amp sounds MUCH better and I love that speaker!" - J. H.